In January, the Martians truly land at IDW Publishing! Mars Attacks crossovers into other franchises on a weekly basis, from Ghostbusters right through to KISS! While the event kicks the New Year off in a fun-filled way, it's these covers and hits that look set to lead the IDW January 2013 charge. A Popeye first on IADW, if that cover doen't look like it sets the stage for the brawl to end it all, then I don't know what does! Could a Martians greatest weakness be a mere can of spinach? 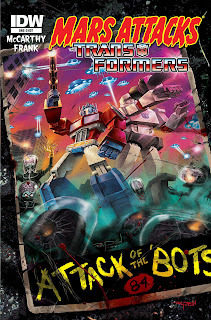 IDW says: The weekly event of the year starts on the second day of the year! Mars Attacks Martians invade five different IDW timelines and universes this month, starting with their assault on Sweethaven. 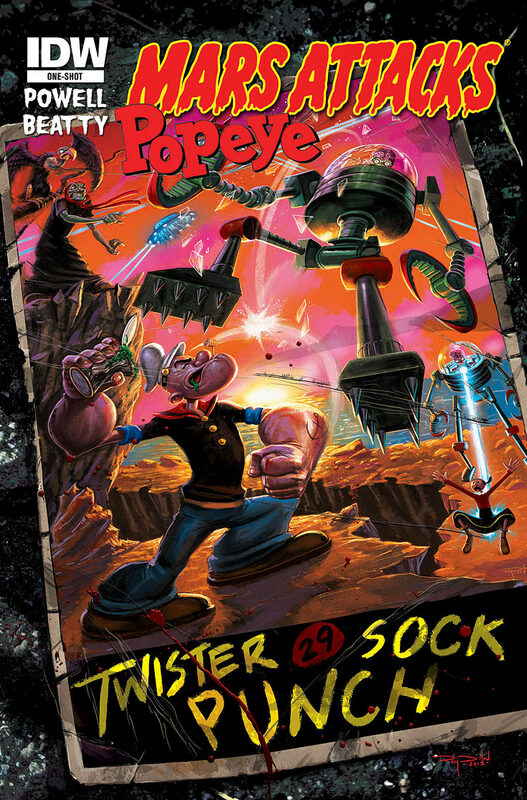 How can Popeye, Alice the Goon, the Sea Hag the rest of the one-eyed sailor's friends and foes possibly contend with this threat from beyond the stars? 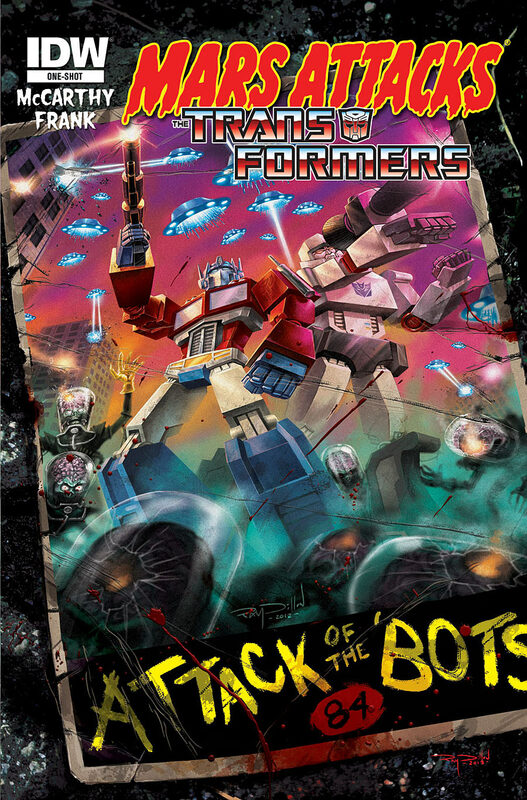 CLOSE CONTENDER: Ray Dillon - Mars Attacks The Transformers When the menace has Megatron side by side with Optimus Prime you know it has to be a major! Where are Grimlock and Soundwave? Have they fallen before the power of the 'Narp! Narp!'? Guess here is where we find out! Other IDW January 2013 highlights include; Doctor Who: Prisoners of Time #1 kicks off a celebration of all the Dr's who have served since the franchises birth in 1963, Thundercracker's secret mission is finally revealed in Transformers Spotlight: Thundercracker, and Leo and co are trapped with Kang in Dimension X in Teenage Mutant Ninja Turtles #18! What do you think? Sound off below. For January 2013 solicits from other publishers as they're released click here, or for more IDW, follow the jump! I'm sorry, I might be able to comment after I stop giggling. I think this cover might be more effective if Bluto was inside the Martian's machine, and Sweet Pea was being held in it's evil clutches. That would have been epic. Oh! And put it high up on an as yet to be finished skyskraper. There you go. Bluto could sure show those Martains a few earth customs they wont find anywhere else! Still I do like your idea for a cover Random! Maybe there's still time to get a poster inserted? My kids don't know who Poppey is. When I make a comment on spinnach they don't get it. Just take my word on that there is this strong guy that is strng for eathing spinnach. How sad. Where are the classics in my country,I ask? I think the same here Aliera. It's amazing how the younger generation can not know of some staples. At work today a lady showed off her new skull ring and said she was just like 'that super-hero'. The guy next to her said Green Lantern, but obviously with a skull ring she was meaning The Phantom. So many classic characters out there the younger generation would enjoy for humour or action, if they just got the right exposure. My Mum is like your Dad, not so much on Popeye, but Ducktales, the Penguin back when he had a blue suit and bright brolly, and bordering on 34 years of knowledge inherited from having a comic nut as a kid. She knows her Fantastic Four and her DC from her Marvel. Shes just all round awesome. Kids don't know who Popeye is? Do they not teach the classics in school anymore?! They don't, Pensol! Can you believe it?